Lose up to 6 inches in circumference. While many patients begin to have improvement after one or two treatment, most patients star to see visible results after the third appointment. Eight treatments achieve optimal results. Reduce cellulite, tighten the appearance of loose skin or wrinkles on any part of your body. The deep heating of Lipo-Ex® will tighten tissue, melt fat, and stimulate collagen production. It is also an effective treatment for reducing stretch marks and the firming of sagging skin. Lipo-Ex™ works by reducing visceral and subcutaneous fat that is sometime untreatable with traditional liposuction and other body sculpting techniques. The Lipo-Ex™ device is applied directly to the skin and emits radio-frequency energy to help melt the fat cells. It also works to tighten the skin and reduce cellulite or stretch marks by stimulating the production of collage and elastin. Results will last as long as you maintain a healthy lifestyle. However, if you return to excessive eating and a lethargic lifestyle, you could regain some of what you lost. 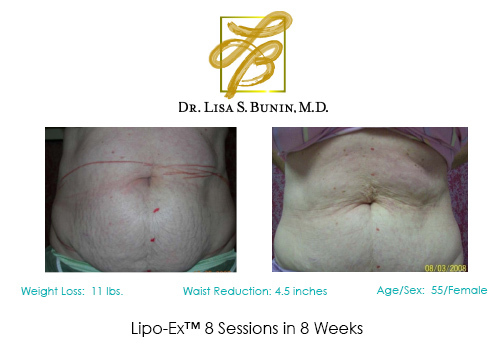 All Lipo-Ex™ treatments are performed at Dr. Lisa Bunin’s office located in Allentown, PA. 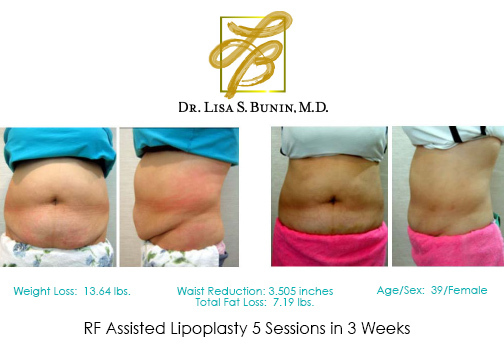 Patients come from all over the Lehigh Valley region to take advantage of Lipo-Ex™ treatments. Her location is also convenient for those in surrounding towns such as Bethlehem, Easton, Wilkes-Barre, York, Bangor, and Reading.